The much-acclaimed creator of the ‘culinary foam’, Adrià is often associated with "molecular gastronomy" and deconstructivist cooking, but his creativity is not confined to just cooking or gastronomy — the values and goals that Adrià has established encompass projects centered on knowledge, education, business and innovation in many fields, disciplines, and industries. 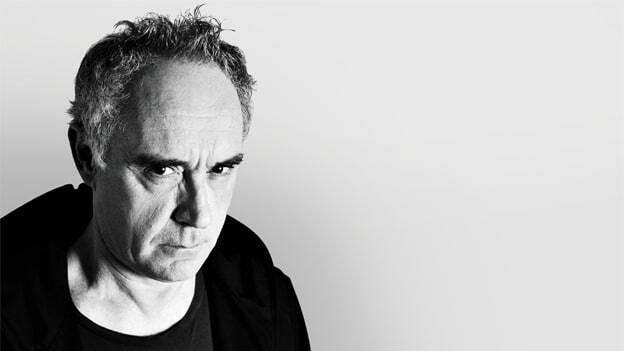 Ferran Adrià is more than just a world-renowned chef. He is a marvel who has cracked the code of creativity and innovation, and has seamlessly juxtaposed gastronomy with the domains of art and technology. The much-acclaimed creator of the ‘culinary foam’, Adrià is often associated with "molecular gastronomy" and deconstructivist cooking, but his creativity is not confined to just cooking or gastronomy — the values and goals that Adrià has established encompass projects centered on knowledge, education, business and innovation in many fields, disciplines, and industries. Adrià and his team have curated a method “Sapiens” to transform organizations through innovation, and have committed themselves towards providing educators in any domain with the necessary means to nurture the next generation of creative thinkers. For Adrià, it is about promoting creativity and innovation and sharing it with everyone with the will and spirit to improve, evolve and innovate, making them participants in the past, present and future experience, researching and experimenting to accelerate talent and help everyone seek their own limits. Ferran Adrià, often called as “the Salvador Dali of the kitchen” is a famed Spanish Chef and co-owner of elBulli, a groundbreaking modernist, unorthodox and avant-garde restaurant in Spain, that has been reconstructed into a research lab and exhibition space called ‘elBulli 1846’ where a team of 20 people research and experiment on creation and innovation to improve efficiency, studying and analyzing how to implement the dream creative ecosystem. This team, led by Ferran Adrià, researches efficiency in innovation by applying the ‘Sapiens method’, carrying out a creative audit and adding to the creative archive. In 2011, Adrià transformed the elBulli restaurant into a non-profit foundation for culinary research called the elBulli Foundation that has been actively educating, enriching, and pushing the boundaries of gastronomy and food research with a vision based on the desire to continue promoting innovation and creativity through the language of cooking and to preserve the legacy and spirit of elBulli for society. Adrià has also analogized his experiences with innovation and from auditing his own baroque creative processes in the “Auditando el proceso creativo”, a multi-platform project promoted and supported by the Telefonica Foundation. People Matters met Ferran Adrià at elBulli Foundation to know more about Sapiens, innovation, creativity, and what inspires him to do more every day at elBulli. The values for El Bulli — creativity, innovation, risk, freedom, passion, effort, ethics, and generosity — how have they enabled you to achieve what you set out to do? These are the words that we have been incorporating little by little to what we do and we have set out to achieve. We have always worked hard to understand what we have done, the whys, and how to be more efficient in the future – basically the concept of analyzing. In the last four years, we have been able to do some of the best innovation that has never been done. These 7 values have been very important to us because we know that following them is the way to go ahead always. And it has always worked for us. All through these years, these have enabled us to understand who we are, what we have done, and what we need to do in the future. The analysis is inherently looking at the past with two objectives: becoming more and more efficient and at the same time making sure that we are not “copying ourselves” and being true to the creations. We believe that values help organizations summarize their DNA in words. For example, ethics is a very important value for us and means transparency but also being direct or on-the-face. Every organization has values, whether they are written or not, and these come from the leaders and the founders and percolates down across the organization’s culture. For us, these are not just words that look good on the walls; they are a way of life for us. We have always tried to have the freedom that an artist has but at the same time, we have always tried to balance it with the business. A businessman is always focused on making money but sometimes you need to earn money to earn your freedom. How do you balance freedom and business? Do you think these two are inherently contradictory? Life is a contradiction, and one needs to find equilibrium. My vision has always been holistic. I have had the opportunity to work with scientists in Harvard, business leaders from across industries, artists, politics – I have had the opportunity to have relationships with creatiu (creativity) and business, and I have learned so much from so many people. That has helped us to create our own philosophy that encompasses so much diverse knowledge. When we were running elBulli, we were a “model” organization. As a restaurant, we mastered efficiency. There are organizations like for example a hospital’s operating theater – they are extremely efficient for few minutes or hours, during the operation per se. For us, at elBulli, we had to operate at that level every day for 12 hours — we were monsters of efficiency and operations – if you were not as crazy about efficiency, it was impossible to work with us. We were machines! When we were closed for the rest of the 6 months, it allowed us to reinvent ourselves. At the same time, we had the opportunity to re-start afresh and most of the talent we had was seasonal, that meant we never had to retrenched anybody. In the case of ElBulli, the problem is that we have done so much that is impossible to simplify. Every day we comprehend new things. Every year we forced ourselves to do something completely new. This model helped us to go very fast but also burned us very fast. We did in 20 years what we should have done in 100 years. This means you need to cut and start again. That is very difficult. We reached so far that we had to stop. Tell us about change and innovation. What does this mean in a business context? It takes longer for any meaningful change to happen. It takes knowledge and research, which people are not really interested in. People just want to get the final result. We haven’t seen a disruptive innovation in gastronomy for a long time because disruptive innovation is indeed very difficult to achieve. If you think about Apple, after Steve Jobs, what has really changed? iPhones just have bigger screens or faster software, but that’s about it. For people like us, innovation happens in small things. Innovation is an investigative process and it has been this innovation process that led us to the recipes and techniques that made us who we are today. We are more interested in the innovation process than in the result itself, and that is what we have been researching for the last few years. But passion is a prerequisite for innovation. It is difficult, however, to feel passion for a project or company that is not your own. 16-hour workdays and creating 365 days a year without monetary incentives requires immense commitment. Hence, innovation must be owned. Innovation is not just the activity of one department. It is the activity of an entire organization. Maintaining creativity is a challenge. An organization can only reach creative resonance if every new cycle of disruption is reinforced by the outcomes of the previous one. Hence, documenting every step of the process is essential. Innovation can save the world and everyone can and should be an innovator, even the people who clean the restaurants! Silos and egos kill creativity, but vanity poses the biggest threat of all. What movie director would accept advice from a cook, or an economist? People accept others’ creative work only if there is admiration and respect. Self-auditing and self-criticism are also a must. That is why we documented our 25 years of disruptive innovation efforts in over 7,000 pages and published the highlights every 5 years. This helped us to revisit the solutions that could have been but never came to fruition. What is your creative process – the one that enables you to replicate excellence over and over again? There is another side to innovation. It is about ultimately understanding things, accumulating and classifying knowledge because when you are accumulating and understanding, you are adding. Arranging and understanding the past is essential in order to move forward. Order is the fundamental premise for understanding what we are talking about and for working efficiently. Order is essential, especially for formulating complex ideas and tackling difficult processes. It means taking decisions, trying to understand how the different elements of disciplines are grouped together. Ordering implies reflecting, grouping, classifying, distinguishing, establishing families — in short, forming categories that allow us to understand the processes that define disciplines. Ordering is a way of encouraging chaotic states that favor the flow of creativity. Tell us about Sapiens and how this can be applied to any discipline, including businesses? Connecting knowledge is the best way to understand, but the question is how knowledge is connected. 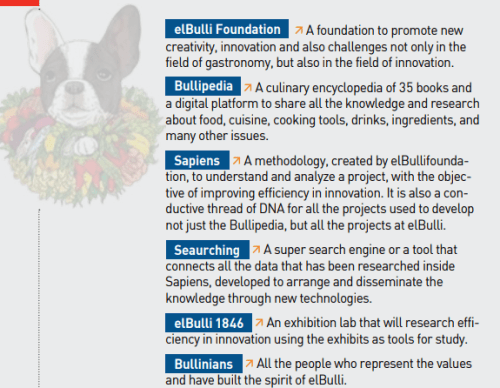 Sapiens is the methodology created by elBullifoundation to understand and analyze a project with the objective of improving efficiency in innovation. Sapiens is like Frankenstein. If you take all the ambits like systems thinking or design thinking, we have taken all. Here are the steps we follow in the Sapience method: 1) Question the status quo – how do we stimulate everyone to question the status quo? 2) Understanding, Classifying, Ordering scientifically. Which method to use? Which system? 3) Go beyond, search beyond, looking for diverse points of view, with maximum freedom and with global outlook, and 4) At the same time, doing all these with very little resources, looking for efficiency. We firmly believe that to maintain effectiveness and efficiency in the fields of innovation and education, it is absolutely necessary to understand the different stages of disciplines, and have therefore developed a methodology that helps us decode the most important processes involved. Although our main purpose was to decode and understand the genome of gastronomy, Sapiens hopes to use it to decode all other creative disciplines. To begin with, it is indispensable to ascertain the questions raised by the discipline, which will enable us to understand it: the what, how, when, where, who, for what and why of all its processes, how they are contextualized and how they interact. We call this methodology Sapiens. There are thousands of processes (that can vary greatly according to the discipline in question), each one of which brings its defining elements into play. A discipline can be decoded to a great extent through these processes, moving from more to less, from maximum to minimum, from general to concrete – a company, a service, a concept, a specific product. For instance, we may decode the processes involved in mobile phone engineering as a discipline, but we may also decide to decode the processes of the Apple company, of the iPhone concept or even of a specific generation of iPhone. In this sense, the creative, productive, experiential and commercial processes of iPhone1, which were essentially disruptive, have little in common with the more evolutionary processes of subsequent generations of iPhones. Reflection and realization are the best ways of understanding. But the point here is that you cannot be a specialist of everything. Sapiens is about this — of knowing what is essential. In art and philosophy and in the business world, accumulating knowledge serves you enough to innovate. But what you have to do is to connect this. I connect food with science. The dialogue between science and food before us did not exist. But I am like a scientist in the kitchen who likes to investigate and give those findings as resources to the cooks.